The school year is winding down and soon all the crazy end of year stuff will be over and summer vacation will be starting. I have to admit, I’ve been feeling a little behind the ball when it comes to planning our summer. 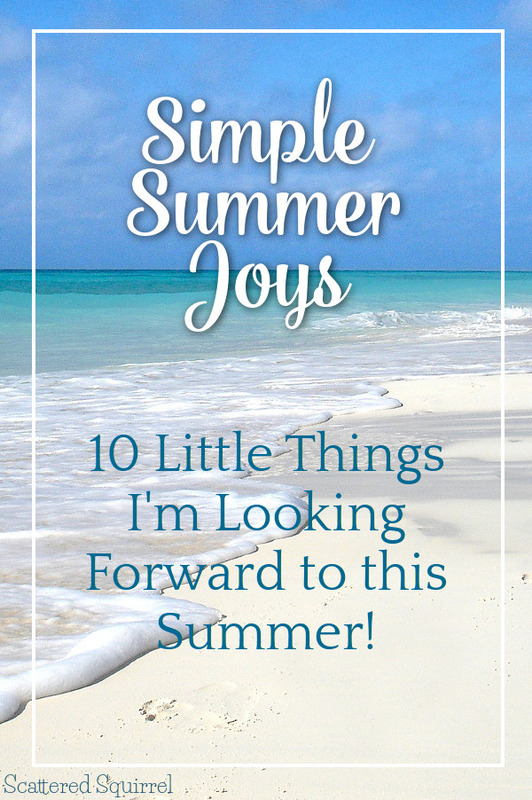 I mean my social media feeds are all full of these amazing ideas for activities, learning, and generally lots of great stuff to keep the kiddos entertained all summer long, and I haven’t even made a single list of things for us to do, and quite honestly I don’t want too. When I did set aside time to work on some sort of plan, I found myself feeling uninspired and a little overwhelmed. I’ve been counting down the days until summer break starts, and suddenly I was looking at the calendar dreading its arrival. I don’t want to dread summer, I want to enjoy it. 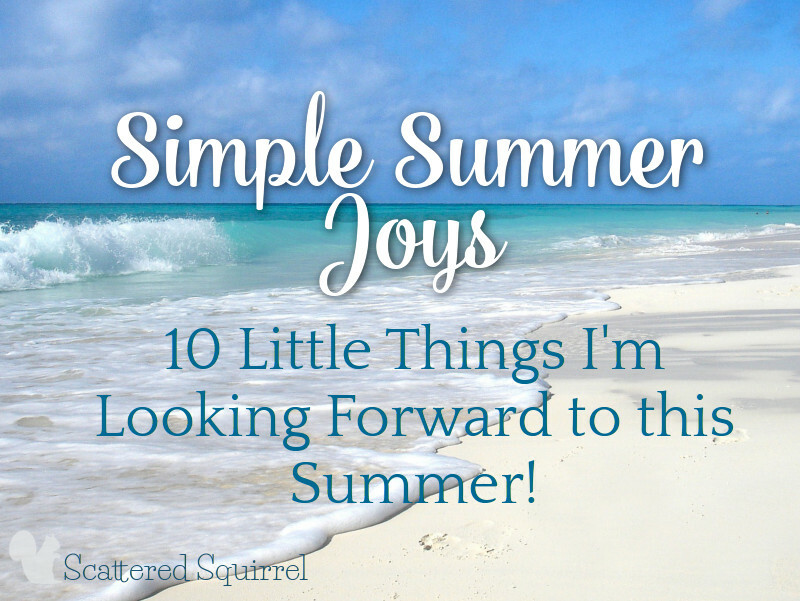 To snap myself out if the summer blahs I decided to make a list of all the things I was looking forward to about summer, and surprisingly many things on that list were small, simple things. 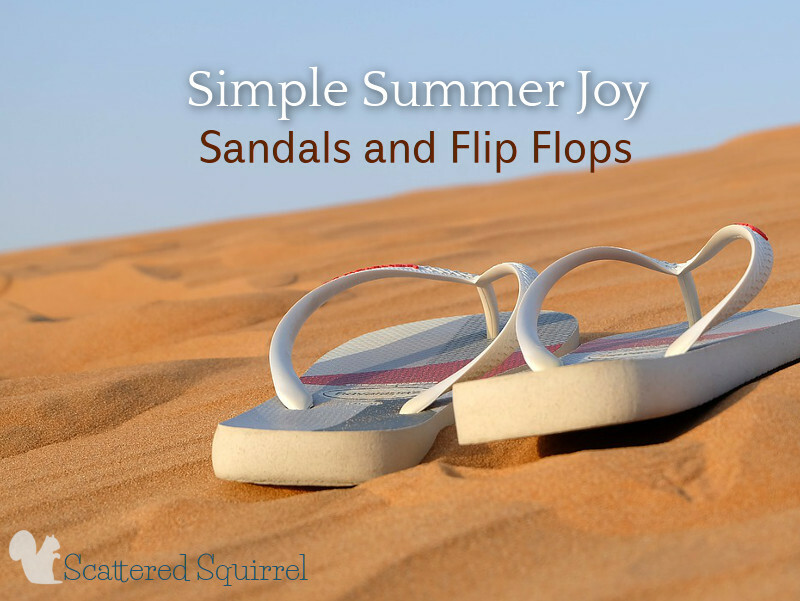 Sometimes the simple things are the most sweet, and when it comes to summer there are a few simple joys I’m looking forward to more than others. Morning coffee is a must for me, and I always enjoy that first cup. It’s a nice way to welcome the day. During the school year though, I don’t always have time to linger over that first cup. I’ve got to get the boys up and make sure we all get out the door on time after all. So when summer break starts, I make sure to take time to enjoy that first cup. I mean really enjoy it. No hurry, no jumping up to check on this or that. I just sit, sip and enjoy! Early summer mornings are the best kind of early mornings. Don’t ask me why, because I can’t quite put my finger on it. I just know that I love those early morning hours when everything is hushed and bathed in that special early morning light. Sure it’s counter-intuitive to number 2, but getting to sleep past my alarm on a Wednesday is such a treat. I don’t mean staying up late the night before and sleeping the day away. 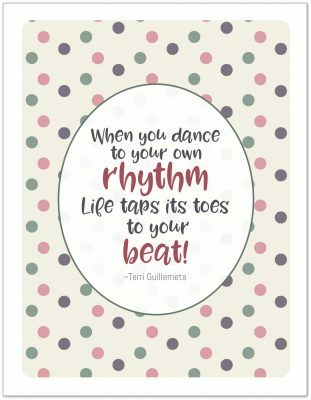 But being able to sleep until you’re ready to get out of bed, in the middle of the week, even if I can only do it one day out of the whole summer – is pure joy! There is nothing quite like sitting in the shade of a tree and reading on a summer afternoon. Whether I’m on my own or reading with Liam, it’s a nice way to sort of enjoy the season and take a breather from the heat. Fresh air and great literature are always a welcome mix. Ice tinkling in the glass, condensation building up on the outside, and something cool and refreshing waiting to quench your thirst – it’s like a mini paradise on a hot summer afternoon. 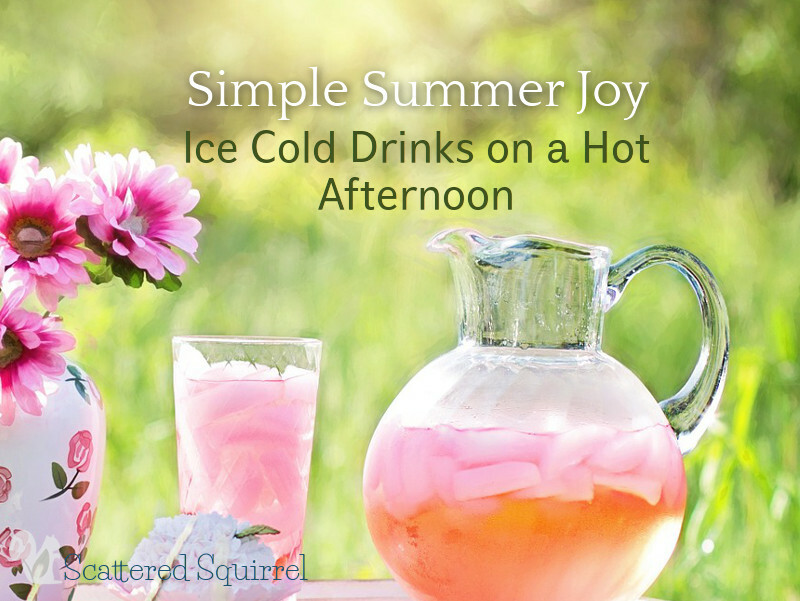 Whether it’s water, ice-tea, lemonade or some other beverage, it’s so nice to just sit and enjoy a cup of something cold in the middle of the day. 6. Popsicles, Snow Cones, and Other Frozen Treats. Frozen treats never taste as good throughout the rest of the year as they do in the summer. ‘Nough said! You can throw a picnic at almost any time in the summer. Toss a blanket on the grass in the back yard and move dinner outside. Whip up some sandwiches for dinner, because it’s too hot to cook anyway, and take them with you to the local park. My favourite kinds of picnics are the kind we don’t plan, just do. I grew up by two mountain lakes, and nothing takes me back to those simpler days of childhood than the smell of summer. Summer smells differently for everyone: For me it’s sand, surf, sunscreen, melted ice-cream and french fries. 9. Sandals and Flip Flops. Good-bye socks! Hello bare feet! Summer shoes are the best. They’re comfy (or they should be) non-confining and best of all, no need for socks! Maybe I’m weird, but I don’t like wearing socks. But not just any sand! It needs to be the moist sand down near the waterline. It’s cool and soft, and walking along the shore is soothing and refreshing. Add in a sunset and the love of your life, and it’s even better! Summer is the season to slow down a little and appreciate the little things. Often times those simple joys are the ones that make our memories oh so sweet. Now it’s your turn – what simple things are you looking forward to this summer? Summer mornings are the best! They are brighter, but also when it’s best to have the house opened up to let in as much cold air before it heats up! Though the transition period (when it’s still getting brighter earlier) always throws me off at first – if getting up with an alarm early enough, it being so bright out always makes me think I’m late, ha! These are great things to look forward to! I’m a total summer gal so every single one of these made me excited for summer too 🙂 Enjoy your summer Alli! I’m a late spring early autumn gal myself, but there is something special about summer. I hope you have a wonderful summer! I completely agree with you Sheila. The simple joys are good balance to the big events. Enjoy your summer too! Oh a farm house sounds like a lovely place to spend the summer, and reading in a meadow sounds heavenly!!! I hope you get out there soon. Thanks so much for stopping. This is so great. I’m terrible at slowing down in the summer. It seems busier. But reading is a joy of mine! I plan on doing more this summer. Great post! I try, REALLY hard, to make sure our summers aren’t too busy, unless it’s busy with family activities. 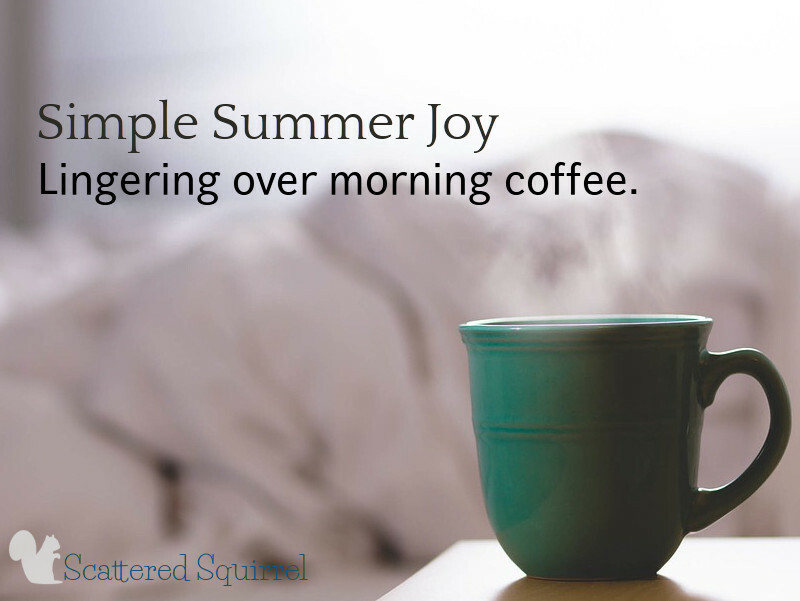 It’s a challenge, and I always crave lazy days in the summer, so I try to enjoy those when I can. Summer is a great time to slow things down and enjoy the little things isn’t it?